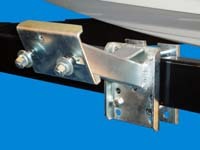 Boat Trailer Accessories | Boat Trailer Spare tire Carriers | VE-VE Inc. NOTE: These Spare Tire Carriers are QUALITY AMERICAN MADE Products, and you DO get what you pay for! 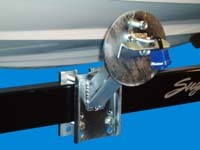 Trailer Spare Tire Carrier, SM-92; small, Non Locking model is designed for 13” maximum tire and wheels. Click on "DETAILS" for more information on tire size and tire location to trailer frame. Trailer Spare Tire Carrier, SM-93; Large, Extra-Offset, Non-Locking HEAVY DUTY model is perfect for bow clearance on wide deep V boats. Click on "DETAILS" for more information on tire size and tire location to trailer frame . 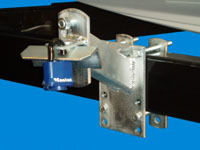 Trailer Spare Tire Carrier, SM-94; Large, Non-Locking HEAVY DUTY model holds tires 7” out from the frame at a 90 degree angle. 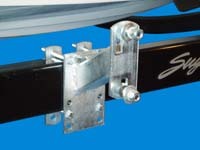 Trailer Spare Tire Carrier, SM-96; small, Locking model is designed for 13” maximum tire and wheels. Another wheel mount stud is Not visable in this picture. (Padlock not included). 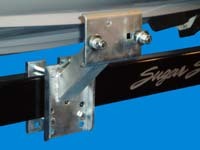 Trailer Spare Tire Carrier, SM-97; HEAVY DUTY model is perfect for bow clearance on wide deep V boats. Another wheel mount stud is Not visable in this picture. (Padlock not included). Click on "DETAILS" for information on tire size and location to trailer frame. 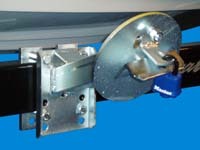 Trailer Spare Tire Carrier, SM-98; Large, Locking HEAVY DUTY model holds tire 7” out from the frame at a 90 degree angle. Another wheel mount stud is Not visable in this picture. (Padlock not included). Click on "DETAILS" for more information on tire size and location to trailer frame.